You know the cucumber salad you eat with your sushi? I love it. I mean LOVE LOVE LOVE it. When I was in high school, I would come home from cross country practice, slice up an entire english cucumber, drizzle it in rice vinegar and chow down. So refreshing! Tons of fiber + hydration. Sunomono is a Japanese cucumber salad served at the beginning of meals. It’s made of marinated cucumber slices topped with sesame seeds. It can be served with a thin, vinegar-based sauce such as Amazu sauce or Ponzu sauce, or with a simple sauce made of just vinegar and sugar. So this salad is my rendition of sunomono with a few extras. FYI, in my opinon: this is one serving. But in your opinion, maybe it’s two? I used my OXO julienne peeler to cut the carrots and cucumber. I just used the outer firm part of cucumber & munched on the soft inside/seedy part while prepping the salad. (You can sub English cucumber if you don’t have Persian or Japanese ) If you don’t have a julienne peeler (get one! j/k) use a vegetable peeler to cut into ribbons, a mandolin to shave into thin slices, or just chop it up with your best chefs knife. It’s going to taste amazing any of those ways. To make the dressing: mix vinegar, maple syrup and salt (or substitute) in medium bowl. Add chili flakes if you want some spice. Toss in cucumber & carrots to coat. Let sit covered in fridge for 30 mins—or even overnight! I served over a bed of chopped romaine lettuce. I just dumped all the carrots, cucumber & vinegar mixture on top of the romaine. And sprinkled with edamame. 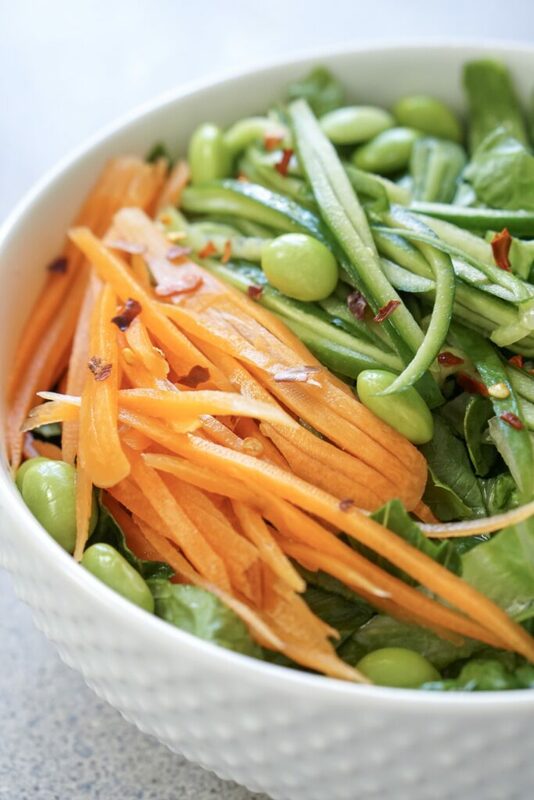 Such a refreshing salad! Serve with protein of your choice! Protein of MY choice is this chili-garlic tofu. So EASY. 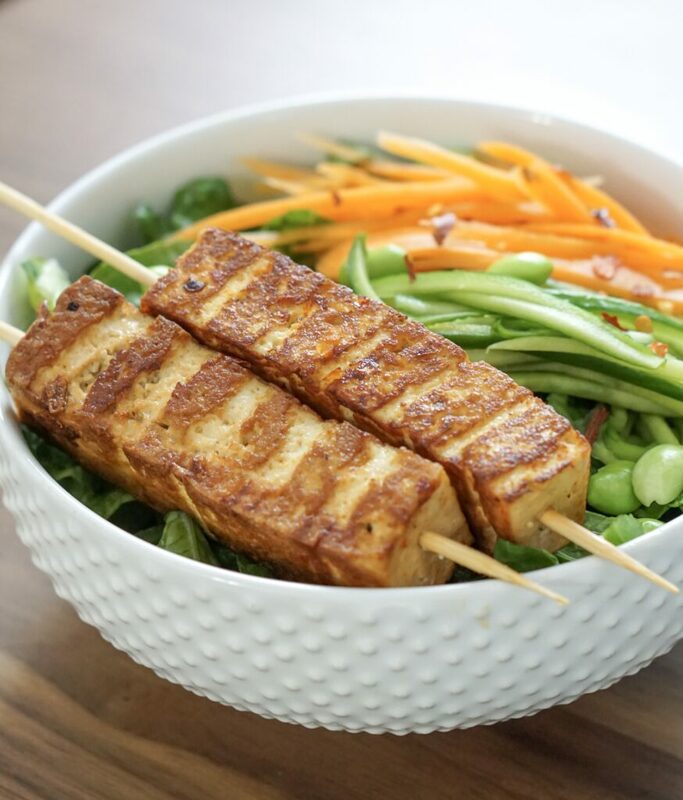 Cut tofu. I cut it into strips like you see in the pictures. but cubes are fine too! Let marinate for about 30 mins. I left it overnight–so it’s flexible and that is an option! 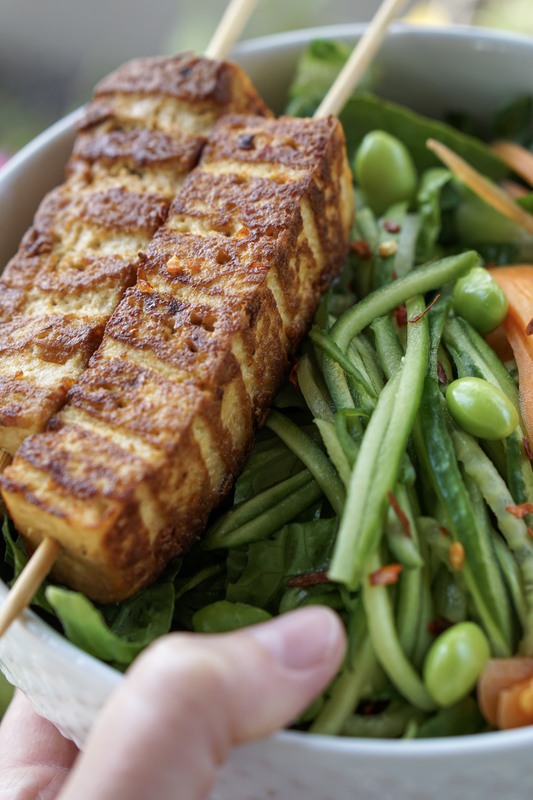 Then brush all sides of tofu with sesame or avocado oil and fry in skillet or grill pan on stove. I like to do medium heat about 4 mins on each side. If you want to do oil free–bake in oven on parchment lined sheet pan at 375º F for about 30 mins. That’s it! Then serve with this delicious salad and ENJOY! 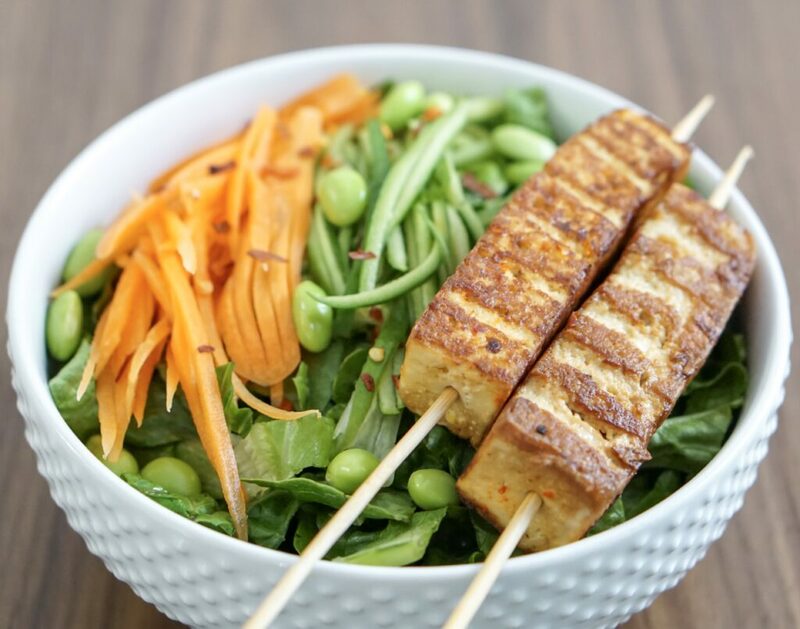 This entry was posted in Meatless Monday, Salads, Tofu, Vegan, Vegetarian.